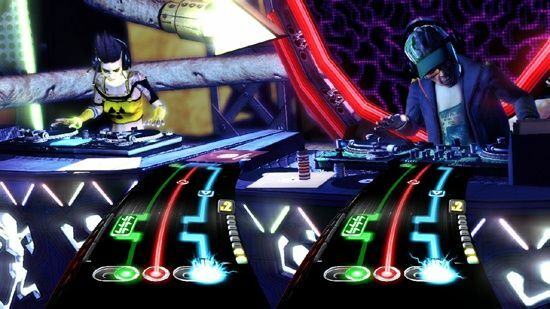 With less than a month until DJ Hero's release, Activision has been showing the game off at various events. Destructoid got some hands on time with the game and seemed to enjoy what was played. For music game veterans, you are in for a shock, as the game plays completely different than any other music game out there despite looking similar in presentation. Because DJ-ing provides the ability to free style effects into music, the game takes a similar approach with itself. During certain portions of the mashups, you can play with audio samples by tapping the red gem, like “Yeaaaaah Boooyyye” or “WHAT!” being the more obnoxious examples. It is only during these specific moments that one is able to use these samples, so, honestly, they feel a little out of place. However, it is nice to see some type of freestyling, and the promose of future DLC sample packs are nice. One last feature is a knob that allows players to change the freestyle options. Certain portions of songs will let you manipulate the audio with this knob so that certain elements will fade in and out. It's cool, but nothing much more exciting than the whammy bar on guitar controllers. Finally, there is the Euphoria button, which is the same thing as Star Power in Guitar Hero. The other unique aspect of the game though is that it does include traditional Guitar Hero style gameplay for some of the rock mixes in co-op mode. the co-op Guitar vs DJ songs proved to be the most interesting. Rihanna's "Disturbia" vs The Killers' "Somebody told Me" is just one more example of this type of gameplay, with one player focusing on the mixing, and the other rocking out with a traditional Guitar Hero guitar. There's also co-op songs for two turn tables (and a microphone). Finally, despite a hefty investment on your part for the turntable, you won't be able to use it with any other games besides DJ Hero titles. That means if you planned to pick up Scratch: Ultimate DJ on the cheap, you're SOL. Page created in 0.2793 seconds.